The NBA has almost always been a heavyweight league in a way the NHL has not been able to follow. It’s not as though the NHL hasn’t cultivated its share of dynastic teams, but in hockey, being the top seed (or even the number two seed) in the conference playoffs is hardly a guarantee of making the Stanley Cup Final or lifting the trophy. In the NBA, the big dogs usually (though not always) win. It’s true that in the dynasty-free 1970s, chaos reigned, but for the most part, the NBA’s in-season powerhouses are the teams that reach the championship podium. I’m not calling this an upset retroactively because San Antonio ran Miami off the floor in 2014, and it’s not an upset because Miami was any less talented than Popovich’s team. Miami was supposed to lose that game. San Antonio was supposed to win its fifth title — its first since 2007 after years of being told their reign in the West was up. … Ray Allen hit the biggest shot in the history of the NBA Finals. Miami was playing on house money after that. If San Antonio rebounded in OT, fine. If San Antonio could pick its heart off the floor, performed the surgery, and take Game 7 in Miami, good for them. The Heat shouldn’t have won the 2013 NBA Finals, but they did. Since the Washington Wizards/Bullets were founded 54 years ago, they have competed for three NBA titles. The Bullets defeated the Supersonics, 4-3, in 1978. Elvin Hayes and Bob Dandridge each averaged 20 points in the Finals, and 31-year-old Wes Unseld pulled down 11.7 rebounds and handed out 3.9 assists. Washington had its title. Of course, three years prior Washington was the heavy favorite against Golden State before Rick Barry had one of the greatest NBA Finals performances we’ve ever seen. I’ll let John Cannon take you through that series. In the rematch between Seattle and Washington in 1979, the Bullets let Gus Williams go “Rick Barry” on them: Williams averaged 28.6 points and 3.6 rebounds and assists each. The SuperSonics scored just 98.9 points per game in the 1978 Finals, but they upped that to 101 points in 1979. Washington, meanwhile, dropped off a cliff from 105.1 to 96.2. After finishing with the best record in the league, the Bullets were, well, firing blanks. These were not the Bill Russell Celtics. As great as Hall of Famer John Havlicek played in 1974, at 33, the Bucks shouldn’t have lost this series. It’s not that Havlicek outplayed Kareem Abdul-Jabbar so much as Kareem being the best player on the floor didn’t matter. Havlicek averaged 26.4 points, 7.7 rebounds, 4.7 assists and 1.9 steals; he dictated the series on both ends. Sure, Kareem was incredible as always — 32.6 points, 12.1 rebounds and 5.4 assists over 49.3 minutes per game (that’s not a misprint — the Game 6 classic that went into double overtime pushed Kareem and Oscar Robertson to a series average beyond 48 minutes per game). However, Havlicek, Dave Cowens, Paul Silas, Jo Jo White and Paul Westphal just ran Milwaukee off the floor. We don’t have pace and efficiency data from 1974, but it’s safe to say Boston was the faster team, and the Celtics played like it. Add Hondo’s historic tear from the foul line (41 for 47 FTA, 87.2 percent), and you get one of the all-time great performances in Finals history silencing an otherwise legendary series from Abdul-Jabbar — his last playoff run in Milwaukee. Consider: How much had to go wrong for the 2004 Lakers not to win the title? Shaquille O’Neal and Karl Malone were both banged up throughout the season, coming in and out of the lineup and simultaneously inserting the mightiest of thorns in Kobe’s backside. This was O’Neal’s final season in L.A., in large part because of the paper thin patience Bryant had for the Big Diesel’s antics. No, it was never as simple as “Kobe asked for Shaq to go.” That said, common sense screams that if Bryant wanted O’Neal to remain a Laker, he would have been. The bitterness between the two superstars didn’t materialize overnight. The 2003-’04 season was essentially O’Neal and Bryant swimming in a pool of piss and vinegar for eight months. Ultimately, the additions of Gary Payton (35) and Malone (40) were overblown — gigantic headlines and ring-chasing expectations fastened to two players well past their primes. Less than a decade later, something similar befell La-La land with the acquisitions of Dwight Howard and Steve Nash, but what made the Lakers’ failures in the 2004 NBA Finals so dramatically terrible was the ticking time bomb in the L.A. locker room, and the “Nobody Believes In Us; We’re Better Than These Guys” aura surrounding the Detroit Pistons. Shorter contracts, an avalanche of new money and, most importantly, foundational defensive rules changes have made what Detroit accomplished in the mid-2000s nearly impossible. The game had never seen an upset like 2004 before — a faceless ensemble toppling a loaded, offensive juggernaut — and will likely not see it again for a long, long time. This and the 1975 Warriors-Bullets series are the only two Finals to share space on Joe’s list and mine. This upset registers because the Lakers had won three recent championships and had dethroned the defending champion San Antonio Spurs on Derek Fisher’s “0.4-second” miracle shot in Game 5 of that series. It wasn’t that the Lakers were a juggernaut in 2004 — Joe explained their dysfunction well — but that they so regularly squirmed their way out of trouble. The Lakers somehow escaped the Sacramento Kings in Game 4 of the 2002 Western Conference Finals. (Vlade Divac tipped the ball to Robert Horry.) The Lakers benefited from the officiating in Game 6 of that same series. They won Game 7 in Sacramento. The Spurs interrupted the Lakers’ march to even more history in 2003, but when Fisher’s shot went in and the Lakers then closed down San Antonio, the prevailing feeling around the league was that Phil, Shaq and Kobe would not be denied. When the Lakers then stole Game 2 against the run of play to tie the series at 1 heading to Detroit, remember that the 2-3-2 format in the Finals had cut against the lower seed in this respect: The lower seed in the 2-3-2 NBA Finals had never won the middle three games at home. Road teams had swept those three games on multiple occasions, but the home team had never gone 3-0. The 1995 Houston Rockets won Games 3 and 4 against the Orlando Magic, but didn’t get a chance to play Game 5 with the brooms they were holding in their hands. The logical way for the 2004 Finals to progress? The Lakers win Game 3, the Pistons win Game 4, the Lakers win Game 5, and the Lake Show closes down the party at home in either Game 6 or Game 7. The Pistons had blown it in many people’s eyes when they let Game 2 slip away. Detroit promptly proceeded to smash the Lakers into pieces in The Palace. Larry Brown became the only coach in the history of basketball to win an NBA title on top of an NCAA tournament national championship. 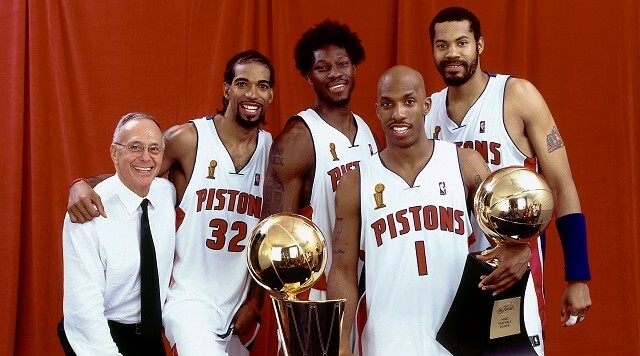 This was a resonant achievement for Detroit, one made even richer by the fact that the Pistons were able to back it up with a run to Game 7 of the following year’s Finals. Brown didn’t make our list of the top five coaches in NBA history, but he’s certainly somewhere in the back end of the top 10. The Miami Heat, with a fresh-legged LeBron and D-Wade, led the series 1-0 and, at home, led Game 2 by 15 points midway through the fourth quarter. The Heat later led the series, 2-1, and had a nine-point lead late in Game 4. The Mavericks won the series by winning three straight games, finishing the deed on the road in Game 6. It was the 2006 Finals in reverse, as Dallas not only gained revenge, but did so in a manner eerily similar to what Miami had done five years earlier. The story of this series has already been written in full. Enjoy it here. The story of this series has already been written in full by John Cannon. See Joe’s link above or find the same link here. I think this is, even now, the single most important series in the history of the NBA in terms of defining so many of the greatest team, greatest player, greatest coach, and greatest dynasty debates we’ve conducted over the past two weeks. Read up on this series here and here and here and here.